Namibia’s gravel roads stretch like sandy tributaries from the main tar arteries that bisect the country. There is something about being on gravel, the slower pace required, the remoteness, the sense of being on a journey­, that makes me want to open my window – wide – to let the fresh air blow my hair into a wild halo and the dust to anoint everything, giving me a sense of freedom not experienced on the tar. Such was my experience once again when I ventured onto the C26 from the city to travel the Spreetshoogte Pass (D1275) to Sossusvlei. I opened my window and breathed a sigh of relief. The burnished sand dunes of Sossusvlei were ahead, but first there was the journey to consider and enjoy. Travelling is not always about reaching the destination – it’s also about having fun along the way. Sossusvlei is a highlight on every tourist’s itinerary, and for good reason. Which gravel tributary to choose to reach the dunes is a matter of preference and time available. Opting for wilderness and wonder, I chose to explore the slower routes: the mountain passes from Windhoek. Alternative routes more frequently used by travellers are the C24 from the B1 at Rehoboth in the direction of the Naukluft Mountains, and the C19 from Mariental via Maltahöhe through the Tsaris Mountains. For those coming from the south, the Fish River Canyon or Aus/Lüderitz area, the C14 via Helmeringhausen or the C13/C27 are your routes northwards. I opted for the roads less travelled – the Spreetshoogte Pass en route to the dunes, and the Gaub and Gamsberg passes on my return. Well worth the adventure and scenery, they both require time and are not to be attempted if rushing to reach the capital. And like all gravel roads in Namibia, they are best not negotiated after dark. The C26 led me through the hills of the Kupferberg Pass and to the turnoff to Spreetshoogte between the Nauchas farmhouses. I encountered more adventure than I had anticipated; the heavy summer rainfall had left its mark on the roads, and road-repair teams were busy with restoring the damage. In mid-winter I still had to ford small rivers before reaching the top of Spreetshoogte, where I was met with breathtaking views and a steep descent. This westerly direction is favoured to appreciate the view ahead rather than an ascent that will challenge your vehicle and leave the vista behind. Stop at the first viewpoint for a good serving of scenery, and then slow down to a snail’s pace for the descent. A signpost along the route recommends a speed of 20 km/hour. Whatever speed you travel, you will probably still smell the overheated components of your vehicle as it struggles along the route. By the time I reached the bottom, my ears were ringing and I felt a complete calm. I switched off the engine and listened to silence, broken only by the faint sound of birds in the distance. The wind blew the grass heads in the sun and blue filled the sky. I had entered into a meditative stupor by chance, lulled by beauty and the peace of the land. The animals must have felt the same way, because I had difficulty trying to manoeuvre my way through a goat roadblock at the next farm. When I reached the C14, 9 km before Solitaire, the first car whizzed by, its dust cloud breaking my bubble of landscape reverie. Solitaire (at the turn-off to the C19) is an obligatory stop along this route. The once frontier-like stopover decked out with several old rusting Chevvies, Fords, a Hudson and a row of cactuses, has grown over the years to include a lodge, a new bakery and tea garden, and now also offers camel rides. The general store with the rainfall scrawled on a blackboard on its outer wall, windows pasted with colourful stickers and the old-fashioned interior is still there, as is Moose (now in the bakery), still churning out his homemade breads and popular (and world-renowned) apple crumble. By noon he had sold 200 kilograms of this tasty delight and was busy with the next batch. “It all started with that old oven,” he says before dashing off to his pies, pointing to a well-used oven standing in the bakery. Solitaire exudes character that masses of tourists are thankfully unable to quell. This is still the place to stop for the apple crumble, muffins and the latest Moose confectioneries; pick up padkos (food for the road) at the general store; fill up with fuel (the only other fuel stop is at Sesriem); and take a break from the road. Guesthouses and campsites are sparsely scattered along the route until you reach the Sesriem area, where a plethora of accommodation options surround you, ranging from luxury lodges to campsites. While several of the lodges have their own campsites, the most popular is the NWR (Namibia Wildlife Resorts) campground at Sesriem because of its proximity to Sossusvlei. A new campsite – Sossus Oasis – and an Engen garage have been built just outside Sesriem, offering an alternative to Sesriem (which is often full) and a head start in the morning to leave for the vlei. 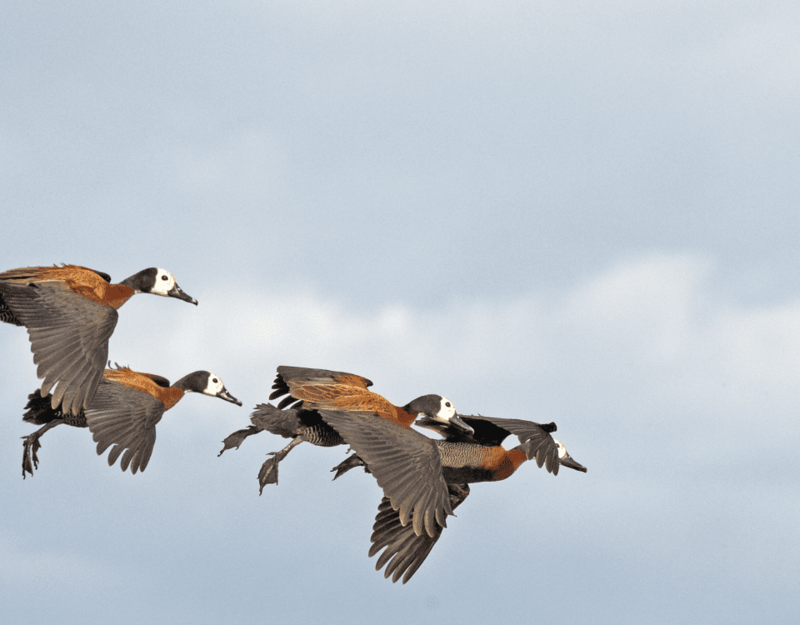 The lodges usually offer activities in the area, including a guided trip to Sossusvlei leaving at dawn, nature and sunset drives, and walks. Scenic flights and hot-air balloon rides (on still days) are available for those willing to spend a bit more and wanting to experience the dunes from above. Sesriem is 83 km from Solitaire, and then it is a further 60 km to Sossusvlei. The gates open only at sunrise (7:00 at the time of my visit) and close at sunset, and there is often a queue to buy permits in the office/shop and a further line of cars awaiting entry at the gate. The early hours are prime time to view the dunes clothed in the soft colours of the morning, so aim to be there as early as possible. It is also extremely hot in the summer months as the sun rises to its zenith. Even in winter, wear closed walking shoes and a hat, and carry sufficient water. From the moment you pass through the Sesriem gate, you embark on the ‘Open Sesame’ experience of dri-ving into another world. Spread out before you is a channel of unusual and awe-inspiring beauty that should be on every bucket list for a once-in-a-lifetime experience. 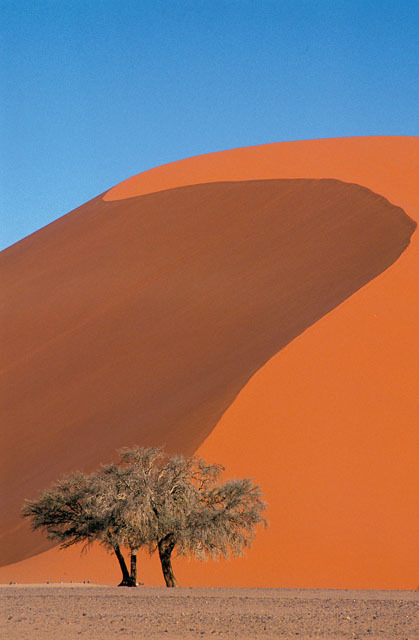 The dunes begin on your right with Elim dune and then continue in sensuous and dappled elegance towards Sossusvlei. At the 45-km mark, Dune 45 is often climbed for its photographic potential before continuing to Sossusvlei. The road crosses the Tsauchab River, usually dry except in times of good summer rainfall, and the green line of trees follows the river course along the base of the dunes with ancient skele-tons of camel-thorn trees bordering the outer reaches. Springbok often cross the road, so as much as you are tempted to accele-rate, keep your speed down and drive with caution. I made so many photo stops along the way that I missed the early-morning light. The sun was already high in the sky when I reached the parking lot, so I resigned myself to taking mid-morning shots. Once at the Sossusvlei parking lot, those with 4×4 vehicles and experience in negotiating soft sand can deflate their tyres and drive the last 5 km to the vlei by themselves. Everyone else must opt for the NWR shuttles, which travel back and forth carrying passengers (for a fee, needless to say). The shuttle first stops at the onset of the 1-km walk to Dead Vlei – unless, however, you prefer to catch the best light at Sossusvlei – and visitors have an opportunity to experience what it’s like to traverse desert. After a trudge through soft sand and a final climb up a small sandy slope, the eerie beauty of Dead Vlei comes into view. Skeletons of camel-thorn trees worn by the elements and time are embedded in the white cracked pan, resembling forms with arms outstretched, some even looking like couples dancing. Behind the pan, terra-cotta dunes rise, Big Daddy being the highest and a challenging climb for the fiercely fit. I decided to walk around the unearthly landscape instead. Once back on the road, a further shuttle ride or short walk over the sand (ask directions from the shuttle driver) takes you to Sossusvlei itself. If the wind isn’t blowing, a walk up the Big Mama dune provides the best views over the vlei. Dry for much of the year, the pan fills up only in times of heavy rain. This is the Tsauchab River’s final destination before it disappears into the dunes. Surrounding the vlei, the red desert sand is dotted with camel-thorn trees, their crescent-shaped pods adorning the ground, and spiky !nara bushes speckle the sand with green. The wind had dispelled any thought of climbing Big Mama, so I stayed low and savoured the sight of the vlei filled with water. I unpacked my picnic lunch and sat at the water’s edge, listening to the wavelets lapping against the shore and watching blacksmith plovers flying overhead. This was a bucket-list experience indeed. I eventually had to pull myself up, remembering that I still wanted to visit Sesriem Canyon, and realising that I would need to race the sun to reach my overnight destination. 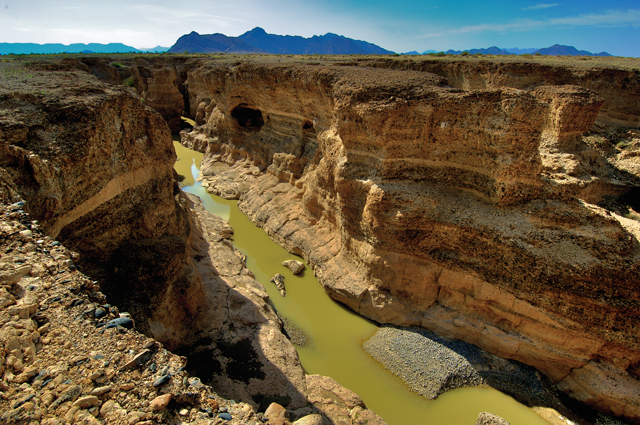 Sesriem Canyon, approximately 4 km from Sesriem, has been sculpted by the Tsauchab River’s tumultuous journey. It was once a place to tie ses rieme, six strands of leather hide, together to lower a receptacle into the canyon to retrieve water, a precious resource in the Namib Desert. Today, a path leads down into the canyon, where a few small pools, de-corated with birds’ feathers and grass heads, usually remain after the rains. I sped off (well, at 80 km/hour) and headed north for my final night, often travelling in a cloud of dust left by travellers making their way to Sesriem before nightfall. (It’s a good idea to switch on lights and reduce speed, taking special care as the road narrows through several farm gates.) The afternoon light coloured everything in gold, and once again I was taken in by the loveliness of the land. All too soon it was time for the journey back to Windhoek. I stopped off at the Tropic of Capricorn and then continued on the C14 to Gaub Pass. The rolling hills had an unusual grassy softness to them, courtesy of the summer rains. A thin stream of water still remained in the Gaub River, and branches wrapped around the tops of trees were evidence of the recent floodwaters. I rested here, taking- pleasure in the place. After the pass, the C14 continues on to Walvis Bay for those journeying to the coast and Swakopmund. I veered off eastwards onto the C26 towards the Gamsberg Pass and Windhoek. The hills became mountains. The small rivers still held water and my vehicle splashed through shallow river crossings. Rosy-faced lovebirds flew into the trees in flashes of iridescent colour, a flock of mousebirds swooped over the road, and lazy cows watched me in sluggish curiosity. The engage-in-low-gear sign for trucks appeared just before the onset of 10 km of Gamsberg bends. In between, I stopped the vehicle several times, leaping out in vain attempts to capture the panorama. Sossusvlei by ©Paul van Schalkwyk. With the Gamsberg and short Kupferberg passes behind me, I was back into city time and rushing to return my vehicle before nightfall. The evening traffic was exaggerated and the slow-paced peace of my journey suddenly seemed far away. It was only when I was tucked warmly into bed that night that the majestic purple-blue mountains loomed up and the striking desert dunes reappeared, their images flowing through me with their indescribable beauty. It is the journeys of our lives that fill us and feed our souls, and this one in particular reminded me of the magnificence of the natural word. And, as is fitting for the end of all good journeys, I smiled and went to sleep, my tank full, snug in the warm memories of the past week. This article appeared in the Dec ‘11/ Jan ‘12 edition of Travel News Namibia.